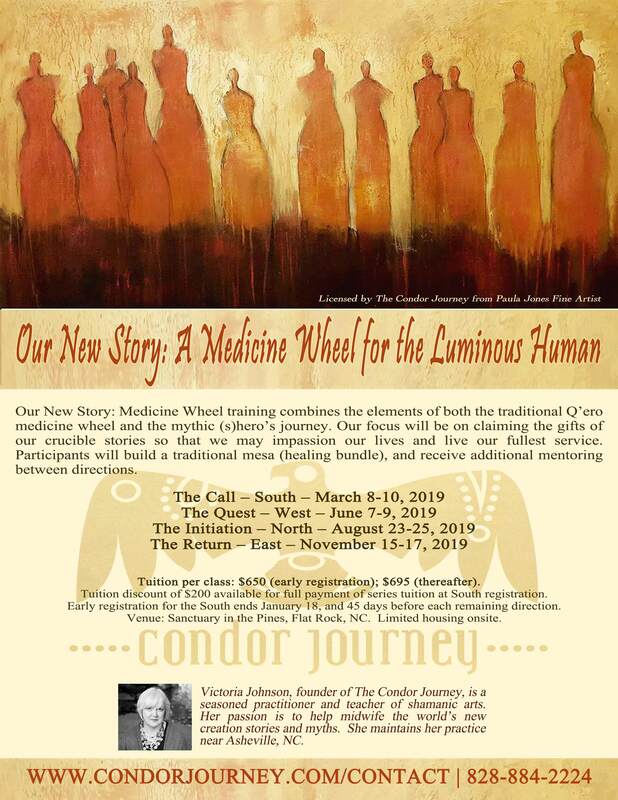 This elegant four class year-long training, will combine the elements of the traditional Q’ero medicine wheel training (mesa creation) and the stages of the (s)hero’s journey, both ancient archetypal maps of consciousness that support a deep healing journey. During this powerful experiential training, you will build a mesa (medicine bundle or altar) for your personal healing work. You will participate in powerful processes and ceremonies that help you to shed your past, your limiting beliefs, and assist you in making peace with your ancestral and karmic lineages. You will receive rites of initiation that link you to ancient lineages. The training will also help you to discover and claim your soul’s purpose, deepen your ability to track (training and strengthening applied intuition), and assist you in visioning the world you wish to create. For more information, please visit the Condor website. www.condorjourney.com. To register, visit www.condorjourney.com/contact or call 828-884-2224.